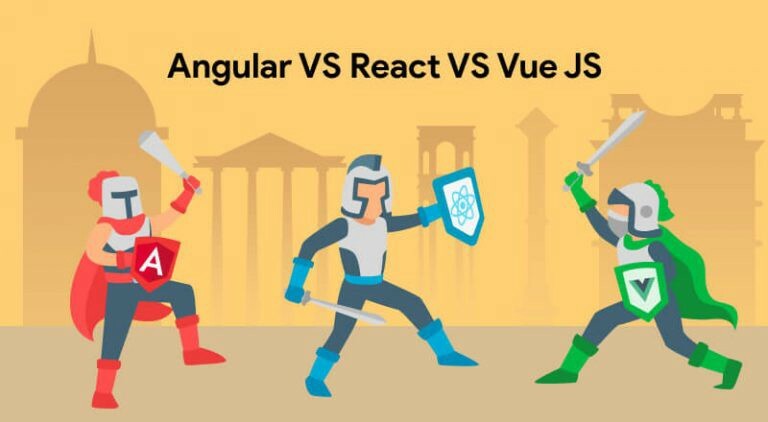 React vs Angular vs Vue.js comparison topic has an endless article debating which is better for web development. Counting from the statistics, features, trends, contributors, downloads, and Github stars — everything is being compared to figure out which one can make most of the investment. Choosing a tech stack sometimes becomes a tedious task as you need to take every factor into consideration including budget, time, app size, end-users, project objectives, and resources. Whether you are a beginner, a developer, a freelancer, or a project architect forming strategies, it is a wise decision to be aware of the advantages and drawbacks of each framework in detail. So, this post will not help you select the best one because that decision majorly depends on scopes and suitability. This post can help you gain the complete knowledge of each framework along with trends and insights. 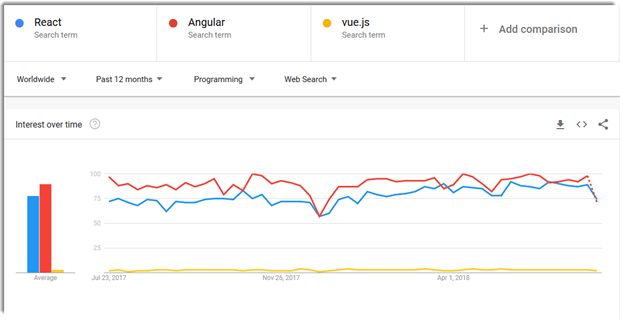 Take a look at this comparison of React vs Angular vs Vue.js according to the Google trends. If we consider past one year, Angular seems like a winner, React is second on the list, leaving a small share for vue.js. Are they mature enough to build scalable applications? Is it easy to find developers for each of the frameworks? Do you know core concepts behind each framework listed here? Have you analyzed performance, speed, and learning curve of each framework? Are there any tools to develop an application using these libraries? Let’s find answers to each question one by one. Angular development is widely popular among developers across the globe and used by giant organizations such as Google, Forbes, WhatsApp, Instagram, healthcare.gov, and many Fortune 500 companies. Now, look at one more statistic of all these three frameworks’ rating on GitHub. This GitHub stars history for Angular, React, and Vue is showing the popularity of Vue.js among developers. Considering a present scenario, Vue has 108,086, React gained 106, 807, and angular achieved 38,654 stars. Vue.js seems to be popular if we observe the above statistics. Despite it is a “one-man-show”, it has the ability to grab the attention of developers due to its well-built and easy architecture. Above all, you should not forget that Angular and React are being used by big names in the industry. Google uses Angular a lot in their projects and brands such as Facebook, Airbnb, Dropbox, WhatsApp, Netflix are using React in their development environment. 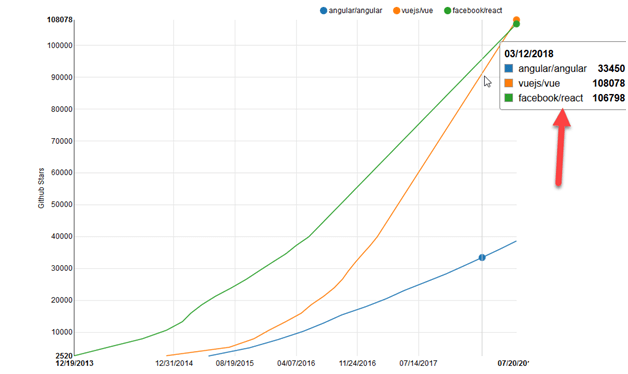 As React is powered by Facebook and Angular is maintained by Google, there’s a no doubt on the growth of both these frameworks. In both frameworks, updates and releases are published frequently but they have things quite maintained when it comes to migrations. Upgrades are not a problem according to the developers in React and in Angular, there will be one major update every six months. The angular team regularly announces version updates, releases, and depreciation periods. If we consider Vue.js in such scenario, there’s a migration helper tool which makes migration easier. But in the large app, it might cause a problem as there is no proper roadmap which focuses on versioning and their plans. React is more flexible than Angular because Angular is a full framework and React is a set of independent, faster, and evolving libraries, and for that, you have to keep an eye on every little module that is no longer supported or maintained. It Is Easy To Find Developers? Angular is a pretty good option in such case. You can easily find Angular developers and it has a well-established community with lots of projects, updates, resources and considerably, it has a sustainable future. JSX or HTML? — What Would You Prefer? Note: You can use JSX in Vue with the help of babel plugin. Framework? Library? What’s the difference? Angular is a framework because it provides you with a good start to build an application with the complete setup. You don’t need to look into libraries, routing solutions, and the structure. You can simply start building. React and Vue, on the other side, are more flexible and universal than Angular. With React, you can do multiple integrations as you can pair, exchange, and integrate libraries with other great tools out there. At this point, React works out of the box due to its flexibility to offer seamless integration but with this, there are chances of wrong decisions and dependencies. Angular involves dependency injection, a concept where one object provides the dependencies to another object. This makes the code cleaner and easier to understand. On the other side, there’s an MVC pattern which splits a project into three different components — model, view, and controller. React does not have any such concept and it helps to build the only View of your application whereas, Angular is based on MVC architecture and it allows developers to build code considering 3 different sections — Model, View, and Controller. Virtual DOM model is very helpful in terms of performance. Both, React and Vue has a Virtual DOM. Due to a well-built structure, Vue delivers great performance and memory allocation. React, on the other side, works well and Angular is already ahead in the competition. Native apps are built for a specific platform. React has React Native, using which you can develop native apps for iOS and Android platform. Angular’s NativeScript is already embraced by many to develop native apps and Ionic framework is widely popular for crafting hybrid apps. Vue’s Weex platform is evolving and currently, there seems to be no plan to take it further, making it a full-fledged cross-development platform. 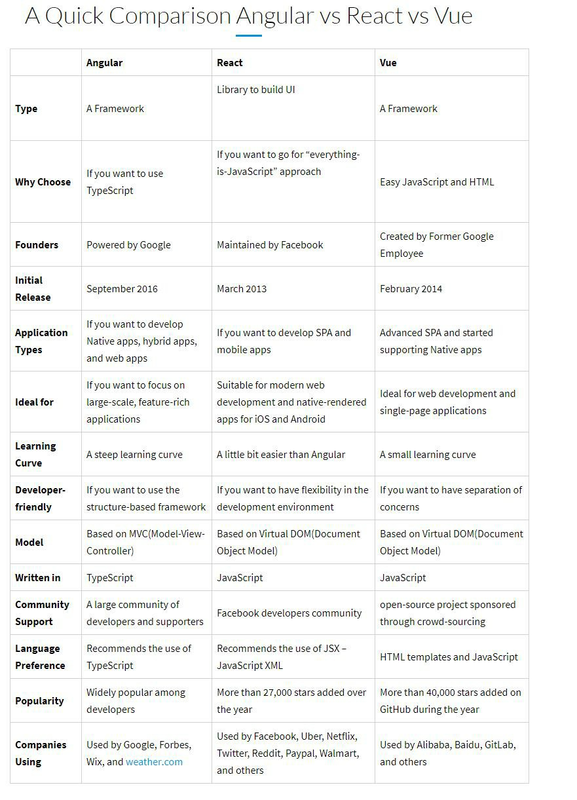 Which Platform Provides An Easy Learning Curve? Angular provides quite informative and clear error message that actually helps developers to fix the issues. This is one of the major differences between React and Angular. Two-way data binding refers to the mechanism where UI fields are bound to model dynamically. When UI element changes, model data is being changed according to it. On the other hand, one-way data flow means there is only a single source of truth — model. Application’s data flows in a single direction, and only the model can change the app’s state. One-way data flow is easy to understand and deterministic whereas two-way data binding is tough to understand and implement due to its complexity. Now if we consider our frameworks in this case, Angular uses two-way data binding, React goes for single-data flow, and Vue supports both. Here, the point is, Angular’s two-way approach provides efficient coding structure and developers find it easy to work with. React offers a better overview and understanding because the data is managed in one direction. Tech world is embracing mircoapps and microservices at present. React and Vue both provide flexibility to select the things which are important for the app. You need to simply add the required libraries to the source code in React and Vue. Angular uses TypeScript and that’s why it is more suitable for SPA rather than microservices. React and Vue, both frameworks offer more flexibility for developing microapps and microservices. Finally, What Should I Choose? If you like flexibility more than other features, use React. If you love coding in TypeScript, go for Angular. If you are a fan of clean code, use Vue in your application. Vue provides the easiest learning curve and it’s an ideal option for beginners. If you want separation of concerns in your application, use Vue. If you are a fond of object-oriented programming, Angular is definitely a pick. Vue is ideal for a small team and a small project. If your app seems to be large and has significant future expansion plan, pick React or Angular. Still, if you can’t decide what to choose and how to proceed further with web development for your business, you can hire skillful developers who not only build your application but help you right from the requirement identification, plan, development, and deployment.